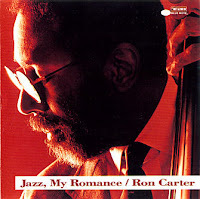 As with virtually all of Ron Carter's recordings as a leader, this CD is primarily a showcase for his bass solos. The unusual combination of musicians (a trio with guitarist Herb Ellis and pianist Kenny Barron) really does not live up to its potential. There are some short spots for Ellis and Barron but their roles are mostly in support of the bassist. Some of the selections (particularly "Sweet Lorraine" and the bassist's original "For Toddlers Only") do have their memorable moments but none of the songs are taken at faster than a medium tempo. Since bass solos (as with most drum showcases) often lose a lot when transferred to record (as opposed to being seen live), this CD is recommended mostly to Ron Carter completists. Produced by Ron Carter for RETRAC PRODUCTIONS, INC.